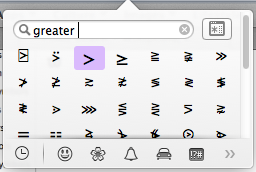 Am I missing something or is the search function in the special characters window not very helpful? For example, I'm editing text and I want to insert the character for π (pi), so I select "Special Characters..." from the menu and get the window. Then I type "pi" in the search field and get the following, which is not helpful. Next I try "greek pi". 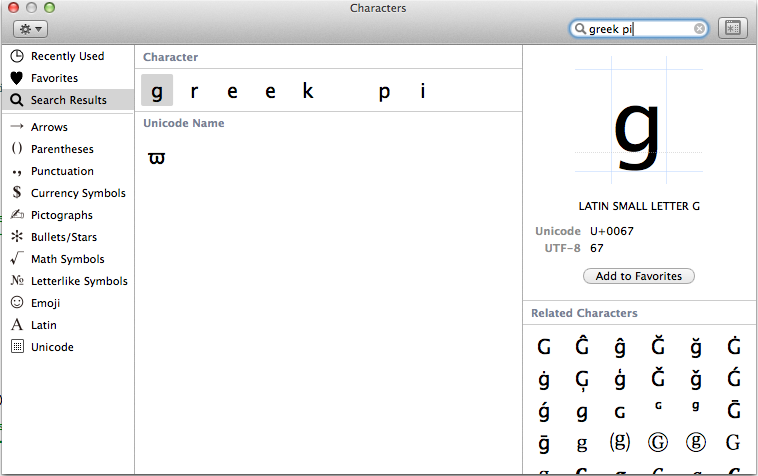 The search results are still surprisingly useless, but it did find a character with name "greek pi symbol". 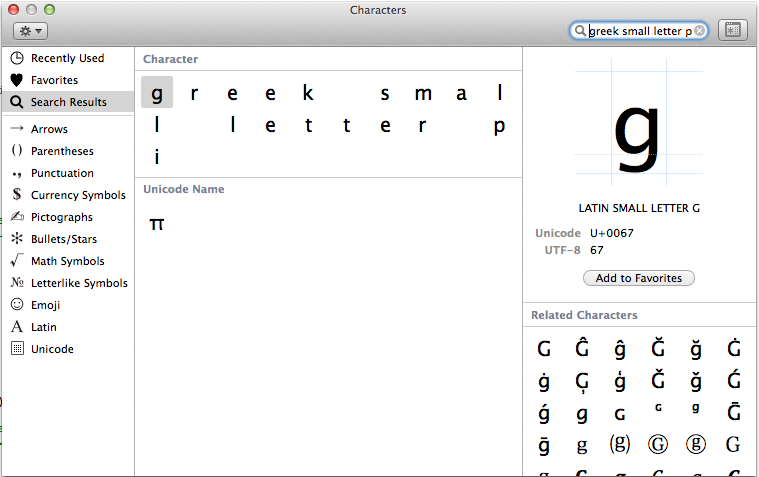 It failed to find the characters I really wanted because they have names like "greek small letter pi"
So to find the character you need to know it's exact unicode name? That doesn't seem right. Is there a better way to search for a character? This is OS X Mavericks. 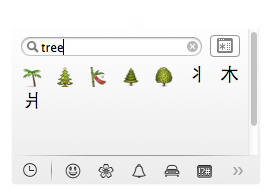 Ctrl+Option+Space in 10.9.x brings up a quick access to special characters in line where you're typing —throughout most every app. The search algorithm is the same of course, which it seems relies on how the charicter is tagged rather than a smart search throughout. Still, in general, I have found the quick access shortcut and search to work well for most things. If you start typing while the special char fly out is open it will run a search. 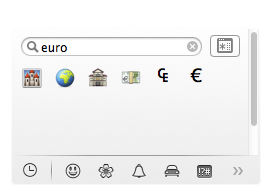 Interestingly, While it seems that some older special characters like π have names that need to be entered exactly to search for them "small greek letter pi = π", emoji will display if just part of the name is searched. 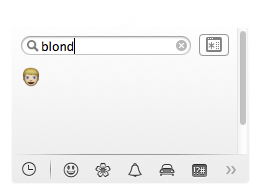 "Person with blond hair=👱" can be searched just by typing in blond. Not the answer you're looking for? 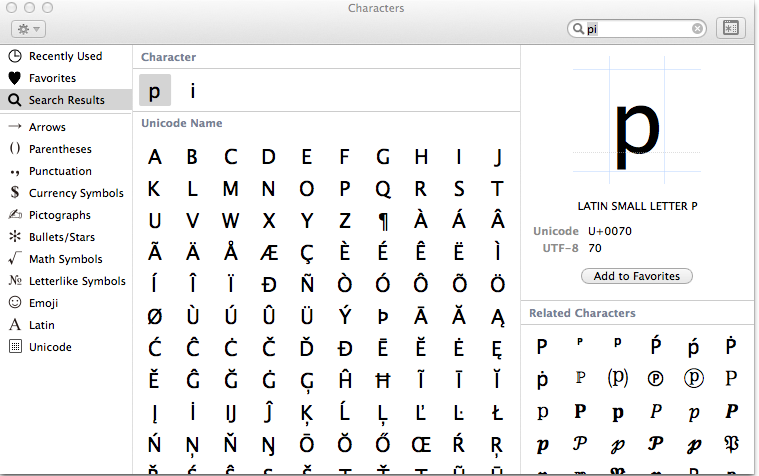 Browse other questions tagged macos mavericks unicode . Does rsync have issues with Unicode Characters in filenames?